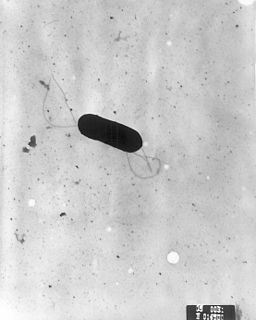 Shigella is a genus of Gram-negative, facultative aerobic, nonspore-forming, nonmotile, rod-shaped bacteria genetically closely related to E. coli. The genus is named after Kiyoshi Shiga, who first discovered it in 1897. The species was named after the American physician Simon Flexner; the genus is named for Japanese physician Kiyoshi Shiga, who researched the cause of dysentery. Simon Flexner, M.D. was a physician, scientist, administrator, and professor of experimental pathology at the University of Pennsylvania (1899–1903). He served as the first director of the Rockefeller Institute for Medical Research (1901–1935) and a trustee of the Rockefeller Foundation. He was also a friend and adviser to John D. Rockefeller Jr.. Upon infection, S. flexneri injects the host cell cytoplasm with ipa proteins using the T3SS—a needle-and-syringe-like apparatus common to many Gram-negative pathogens. These ipa proteins induce "membrane ruffling" by the host cell. Membrane ruffling creates membrane pockets which capture and engulf the bacteria. Once inside, S. flexneri uses host cell actin for propulsion to move directly from cell to cell using a cellular mechanism known as paracytophagy,   similarly to the bacterial pathogen Listeria monocytogenes . Paracytophagy is the cellular process whereby a cell engulfs a protrusion which extends from a neighboring cell. This protrusion may contain material which is actively transferred between the cells. The process of paracytophagy was first described as a crucial step during cell-to-cell spread of the intracellular bacterial pathogen Listeria monocytogenes, and is also commonly observed in Shigella flexneri. Paracytophagy allows these intracellular pathogens to spread directly from cell to cell, thus escaping immune detection and destruction. Studies of this process have contributed significantly to our understanding of the role of the actin cytoskeleton in eukaryotic cells. TRAF6 is a TRAF human protein. Glutamine is an α-amino acid that is used in the biosynthesis of proteins. Its side chain is similar to that of glutamic acid, except the carboxylic acid group is replaced by an amide. It is classified as a charge-neutral, polar amino acid. It is non-essential and conditionally essential in humans, meaning the body can usually synthesize sufficient amounts of it, but in some instances of stress, the body's demand for glutamine increases, and glutamine must be obtained from the diet. It is encoded by the codons CAA and CAG. Ubiquitin-conjugating enzyme E2 N is a protein that in humans is encoded by the UBE2N gene. RnaG is a small regulatory non-coding RNA encoded by the virulence plasmid of Shigella flexneri, a Gram-negative pathogenic bacterium that causes human bacillary dysentery. It is a first regulatory RNA characterised in S. flexneri. The RNA is 450 nucleotides long and it contains a region with specific secondary structure that interacts with icsA mRNA and forms a transcription terminator. Acting as antisense, RnaG is transcribed from the complementary strand of its target, icsA mRNA. The activity of the incA protein is crucial for spreading of the bacterial pathogen in the host cells. Borrelia burgdorferi is a bacterial species of the spirochete class of the genus Borrelia. B. burgdorferi exists in North America and Europe and until 2016 was the only known cause of Lyme disease in North America. Borrelia species are considered diderm (double-membrane) bacteria rather than Gram-positive or negative. Pascale Cossart is a bacteriologist at the Pasteur Institute of Paris, and the foremost authority on Listeria monocytogenes, a deadly and common food-borne pathogen responsible for encephalitis, meningitis, bacteremia, gastroenteritis, and other diseases. The PrfA thermoregulator UTR is an RNA thermometer found in the 5' UTR of the prfA gene. In Listeria monocytogenes, virulence genes are maximally expressed at 37 °C but are almost silent at 30 °C. The genes are controlled by PrfA, a transcriptional activator whose expression is thermoregulated. It has been shown that the untranslated mRNA (UTR) preceding prfA, forms a secondary structure, which masks the ribosome binding region. It is thought that at 37 °C, the hairpin structure 'melts' and the SD sequence is unmasked. Listeria monocytogenes is a gram positive bacterium and causes many food-borne infections such as Listeriosis. 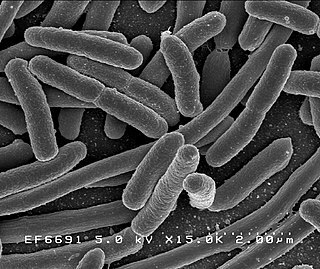 This bacteria is ubiquitous in the environment where it can act as either a saprophyte when free living within the environment or as a pathogen when entering a host organism. Many non-coding RNAs have been identified within the bacteria genome where several of these have been classified as novel non-coding RNAs and may contribute to pathogenesis. The Actin assembly-inducing protein (ActA) is a protein encoded and used by Listeria monocytogenes to propel itself through a mammalian host cell. ActA is a bacterial surface protein comprising a membrane-spanning region. In a mammalian cell the bacterial ActA interacts with the Arp2/3 complex and actin monomers to induce actin polymerization on the bacterial surface generating an actin comet tail. The gene encoding ActA is named actA or prtB. Listeria phage P100 is a virus of the family Myoviridae, genus Twortlikevirus. Daniel A. Portnoy is a microbiologist, the Edward E. Penhoet Distinguished Chair in Global Public Health and Infectious Diseases, and a Professor of Biochemistry, Biophysics and Structural Biology in the Department of Molecular and Cell Biology and in the Division of Microbiology in the Department of Plant and Microbial Biology at the University of California, Berkeley. He is one of the world's foremost experts on Listeria monocytogenes, the bacterium that causes the severe foodborne illness Listeriosis. He has made seminal contributions to multiple aspects of bacterial pathogenesis, cell biology, innate immunity, and cell mediated immunity using L. monocytogenes as a model system and has helped to push forward the use of attenuated L. monocytogenes as an immunotherapeutic tool in the treatment of cancer. ↑ Ryan KJ; Ray CG; Sherris JC, eds. (2004). Sherris Medical Microbiology (4th ed.). New York: McGraw-Hill. ISBN 978-0-8385-8529-0. LCCN 2003054180. OCLC 52358530. ↑ Stevens J; Galyov EE; Stevens MP (2006). "Actin-dependent movement of bacterial pathogens". Nature Reviews Microbiology. 4 (2): 91–101. doi:10.1038/nrmicro1320. PMID 16415925. ↑ Ogawa M; Handa Y; Ashida H; Suzuki M; Sasakawa C (2008). "The versatility of Shigella effectors". Nature Reviews Microbiology. 6 (1): 11–16. doi:10.1038/nrmicro1814. PMID 18059288. ↑ Robbins JR; Barth AI; Marquis H; de Hostos EL; Nelson WJ; Theriot JA (1999). "Listeria monocytogenes exploits normal host cell processes to spread from cell to cell". Journal of Cell Biology. 146 (6): 1333–1350. doi:10.1083/jcb.146.6.1333. PMC 1785326 . PMID 10491395. 1 2 3 Sanada T; Kim M; Mimuro H; Suzuki M; Ogawa M; Oyama A; Ashida H; Kobayashi T; Koyama T; Nagai S; Shibata Y; Gohda J; Inoue J; Mizushima T; Sasakawa C (2012). "The Shigella flexneri effector OspI deamidates UBC13 to dampen the inflammatory response". Nature. 483 (7391): 623–6. doi:10.1038/nature10894. PMID 22407319. ↑ Peng, Junping; Yang, Jian; Jin, Qi (2011-04-05). "An Integrated Approach for Finding Overlooked Genes in Shigella". PLOS ONE. 6 (4): e18509. doi:10.1371/journal.pone.0018509. ISSN 1932-6203. PMC 3071730 . PMID 21483688. ↑ Wang, Ligui; Yang, Guang; Qi, Lihua; Li, Xiang; Jia, Leili; Xie, Jing; Qiu, Shaofu; Li, Peng; Hao, RongZhang (2016-01-01). "A Novel Small RNA Regulates Tolerance and Virulence in Shigella flexneri by Responding to Acidic Environmental Changes". Frontiers in Cellular and Infection Microbiology. 6: 24. doi:10.3389/fcimb.2016.00024. ISSN 2235-2988. PMC 4782007 . PMID 27014636. "Shigella flexneri". NCBI Taxonomy Browser. 623.